Camelback Mountain is probably the most recognizable natural feature of the City of Phoenix. Named Camelback Mountain because it resembles a resting camel with a large hump on its back, this is one of the most popular recreational areas for hiking in the City of Phoenix. While there are scores of hiking trails in the parks, mountains and desert recreational areas around Maricopa County, Camelback Mountain is unique because it is located right in Central Phoenix, about 20 minutes from Sky Harbor International Airport. 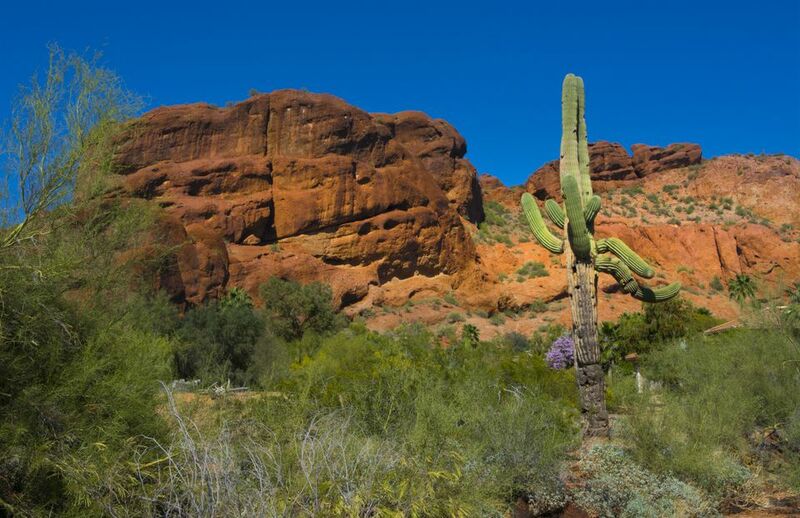 That makes it not only a popular hiking spot for locals, but also for visitors who are looking for a hiking opportunity close to downtown Phoenix. There are two main hiking trails at Camelback Mountain. Both are considered moderate to strenuous hikes, depending on who is evaluating it. The ascent to the peak (2,704 ft) is only about 1,200 feet, but paths may be uneven, narrow and rocky in parts. Echo Canyon Trail is the most popular trail, and is about 1.325 miles each way; Cholla Trail is longer at about 1.6 miles in, so it is not as steep as Echo Canyon. The Cholla Trail is the less utilized of the two. Both are open sunrise to sunset every day of the year. Echo Canyon was closed from January 28, 2013, through January 14, 2014, for renovation. It is now 1/8th of a mile longer than it was before with a more gradual climb in the beginning. New signage, new restrooms, additional bike racks and an expanded parking area have been added. Even with improvements, these are dangerous and difficult hiking trails. There are many falls, injuries and helicopter rescues that take place each year, and there are fatalities. Be careful out there, and bring plenty of food and water. Bring plenty of water and some snacks. A backpack is preferable, so you can hike hands-free, especially when climbing over rocks on the Cholla Trail. The two trails actually join at the top, such that you could climb up one and down the other. Remember, though, that unless you plan to hike it twice on one outing, you won’t get back to your car that way! While you can hike all year long, during the summer you should get there very early. By 8 a.m. it is already hot, and it doesn't really cool down here at night in the summer. Wear hiking shoes or sturdy, supportive walking shoes. Not all parts of the trails are evenly graded. Stay on the marked trails. There are desert critters out in the desert that you don’t want to deal with on your hike. There’s not much shade on the Cholla side of the mountain. Wear sunscreen, a hat and bring sunglasses for either hike. Remember that hikers going up have the right of way. Parking is downright frustrating at both trails. Come early and at off-peak times, like weekday afternoons during fall and winter. Carpool. You may have to walk a mile from your parking spot before you even start your Camelback Mountain hike! Enjoy the beautiful views of Phoenix and Scottsdale! Dance! It's Good for You! Which Salsa is the Best? You Decide!